The SCOTTS SYNC™ System Cordless Lithium-Ion Blower is the perfect addition to all of your SCOTTS® lawn care products. The innovative charging station allows the user to charge the battery on the tool or alone like a traditional charger. The wall mounting charger doubles as a hanger for the tool; no more excuses for an unorganized workspace. Powered by the SCOTTS® 20V, 2.0 Amp Hour battery, this blower is perfect for all of your light clearing needs. 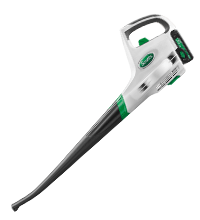 Ideal for hard surfaces, the SCOTTS® SYNC™ System blower is great for clearing walkways, decks, garages, and driveways. No brooms, cords or gas cans are needed when you have this unit. Backed by a 3-year warranty, the SCOTTS® SYNC™ System Blower is engineered for performance and durability.